This clearly structured textbook/reference presents a detailed and comprehensive review of the fundamental principles of sequential graph algorithms, approaches for NP-hard graph problems, and approximation algorithms and heuristics for such problems. The work also provides a comparative analysis of sequential, parallel and distributed graph algorithms – including algorithms for big data – and an investigation into the conversion principles between the three algorithmic methods. 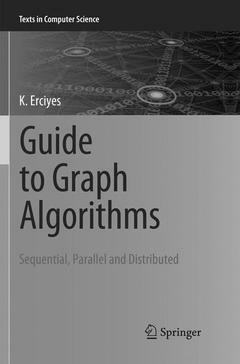 This practical guide to the design and analysis of graph algorithms is ideal for advanced and graduate students of computer science, electrical and electronic engineering, and bioinformatics. The material covered will also be of value to any researcher familiar with the basics of discrete mathematics, graph theory and algorithms. Dr. K. Erciyes is an Emeritus Professor of Computer Engineering at Ege University, Turkey. His other publications include the Springer titles Distributed Graph Algorithms for Computer Networks and Distributed and Sequential Algorithms for Bioinformatics.